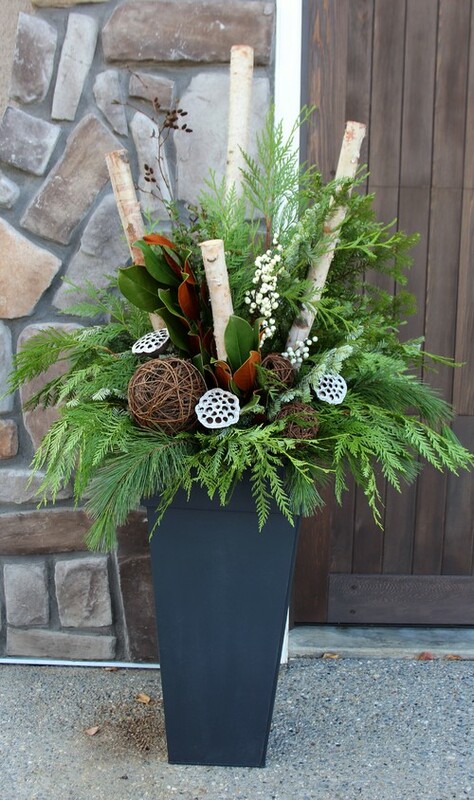 Some of the most stunning Christmas outdoor decorations can be created easily, such as these winter planters! 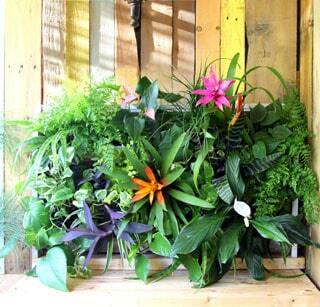 Most of us think that colorful outdoor planters are for spring and summer. There may be less flowers to choose from, but even in very cold climates, nature has plenty to offer. 1. How to use a variety of evergreen plants and cuttings, colorful berries, seed pods, and branches to create winter planters and gorgeous Christmas outdoor decorations which last for weeks and months! 2. How to add other decorative elements such as ribbons and ornaments in winter planters to create beautiful Christmas outdoor decorations. 3. 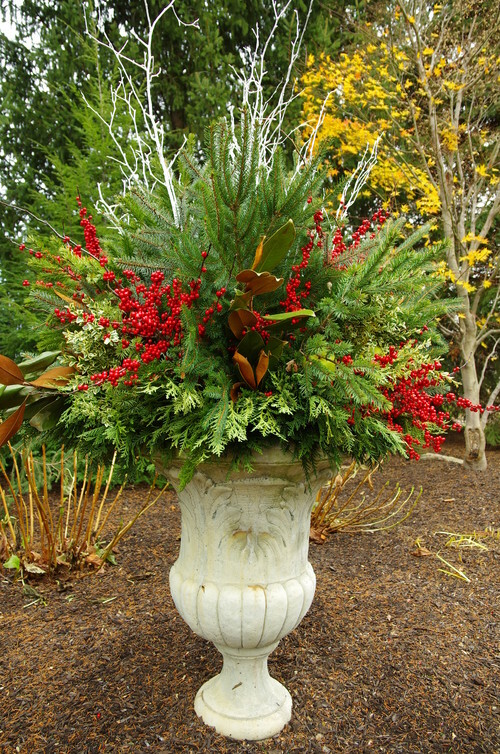 How to choose pots and urns for these winter container gardens. The festive season will be upon us before we know it. These splendid winter planters will be such fun DIY projects to make for our Thanksgiving and Christmas outdoor decorations! 1 & 2. Best plants and cuttings for winter planters and Christmas outdoor decorations. Here are the most popular plants and elements used in some of my favorite winter outdoor planters: conifers such as Pine, Cedar, Spruce, etc. and evergreen trees and shrubs such as Magnolia, Eucalyptus, Boxwood, Holly, Privet, etc. Actually, you can create a mini version of these planters for a Christmas table decor centerpiece using the same elements! Below is a super easy Christmas centerpiece I made, and tutorial here! Make a gorgeous Christmas centerpiece in 10 minutes! Tutorial and video here! 3 & 4. Choosing containers for outdoor winter planters. Size: Is it the right scale for the space? Material: Can it withstand the outdoor winter temperature, snow, rain, etc? For example, when we lived north of Seattle for 6 months, many terra cotta pots we brought from California cracked due to rain and freeze. Materials like metal milk containers or half wooden wine barrels are all durable choices for outdoor winter conditions. The vintage milk tin original image source is lost. Please let me know if you find it! Get Creative: If you can find something you absolutely love, such as a real or faux stone urn, go for it. There are also many possibilities by putting durable plastic pots inside something more stylish. Pam at House of Hawthornes used a gorgeous harvest basket, you can check out her wonderful project here. 5 & 6 . How to make a Christmas planter arrangement. 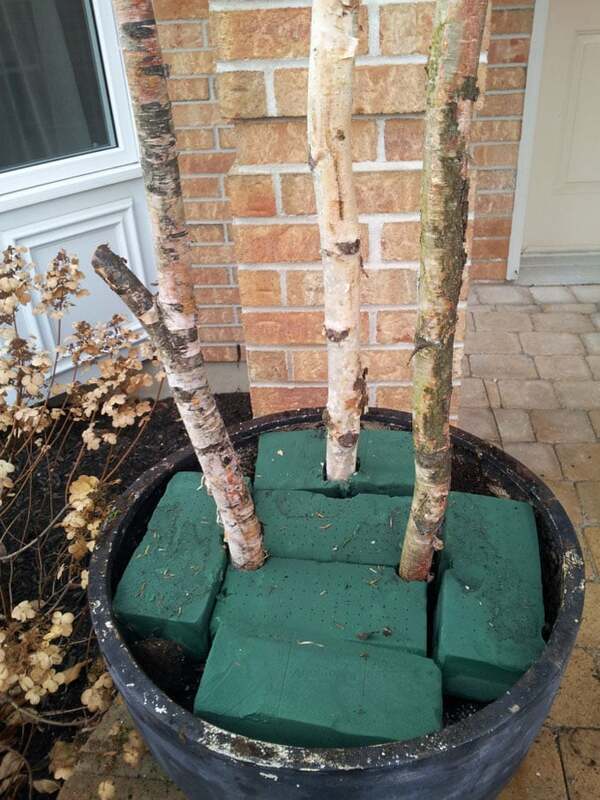 Here is a wonderful tutorial on how to create your own outdoor winter planters with birch, magnolia and conifer branches. To make it more festive for Christmas outdoor decorations, add beautiful accents like white birch branches, red berries, and big pine cones. Another beautiful example of the birch – magnolia – conifer mixed planter. If you love greenery in winter, you may also like to learn this fool-proof method on how to grow beautiful indoor plants easily in glass bottles and water! 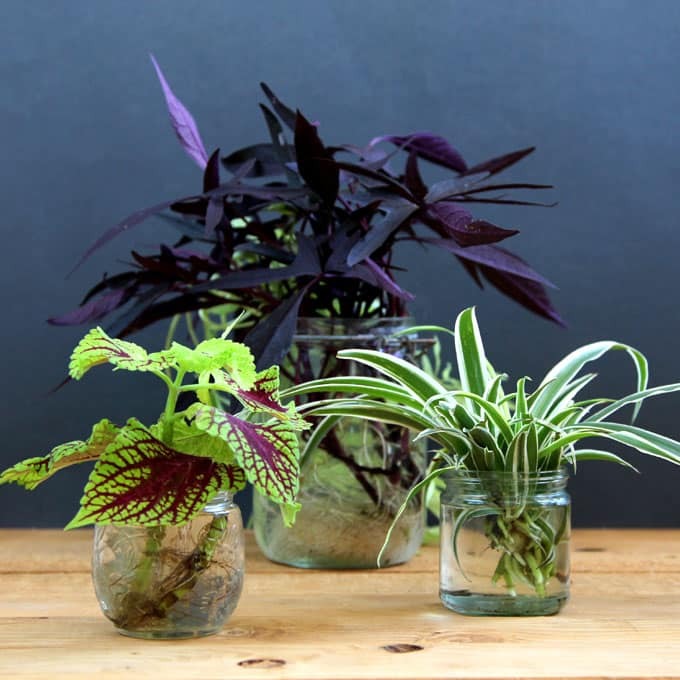 How to grow beautiful indoor plants easily in glass bottles and water- the easiest thing ever! 7 – 10. Add festive details to your winter planters and Christmas outdoor decorations. Next, let’s look at some more creative elements to add to our winter and Christmas planters! Previous Post: « This Insanely Beautiful DIY with Recycled Glass Jars will Make You So Happy! Gosh these plants and arrangements are just so so beautiful. I agree winters are gloomy and we should attempt to make it more lively. Your pictures have encouraged me to do some work with my mini garden in our balcony as well. Thanks for such a wonderful idea. ARGHH! I’m actually excited to try this ! Brilliant Idea I’ve never seen these before but these would make fantastic Christmas presents! Thanks for sharing! Never too early for Christmas inspiration! 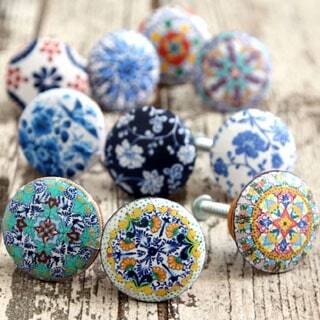 These are beautiful and make me wish I didn’t live in an apartment! I just love these ideas for outdoor planters! They can be so versatile and changed up for different holidays. I am already in full blown holiday season mode right now. This post just fed my obsession. Thanks for sharing! I love seeing all these Fall and Christmas decor and planters! I could keep these up year round lol! It looks fairly easy to put together. 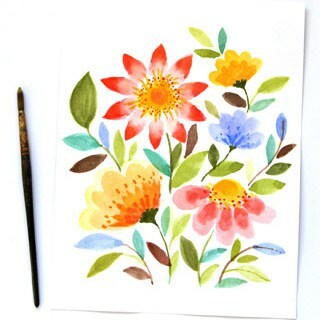 My summer flowers will need to be swapped for holiday theme soon so I’ll keep this in mind. I am super excited for Christmas season! I think the holidays will be around the corner before we know it. These planters are stunning! I can’t believe it’s time to start thinking about the holidays already! Those plants are gorgeous. The colors are so vibrant and add such a festive touch to everything. I’m so happy we can start thinking about Christmas already! I’m looking forward to this one as it is the first Christmas my husband and I spend together! These decor and plants look so good and colorful. A great way to decorate. I don’t have a green thumb but I’d love to give gardening a try even during the colder months of the year! I think this is such a helpful guide especially for beginners like me! These are beautiful and look really great. Thank you for sharing such a nice post! Those are all just beautiful and s such a good idea. I made a live planter of evergreens last year and it’s still growing away. I add little things in it for each season. I love these planters! They are gorgeous! I can’t wait to use some if these ideas in mine. 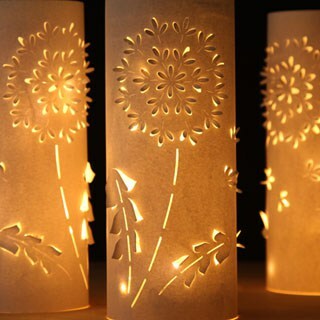 These are beautiful! I swap my summer flowers out of my pots every year and just stick the evergreens right into the same soil. No need to spend money on oasis. Give them a good soaking and by spring when I am ready to put flowers back in, some of the evergreens have even rooted in the dirt. They stay nice and green all winter. I love walking in the woods and can gather these elements easily! I love these Christmas/Winter decors! Thanks for sharing. I am in sSouthern. California. 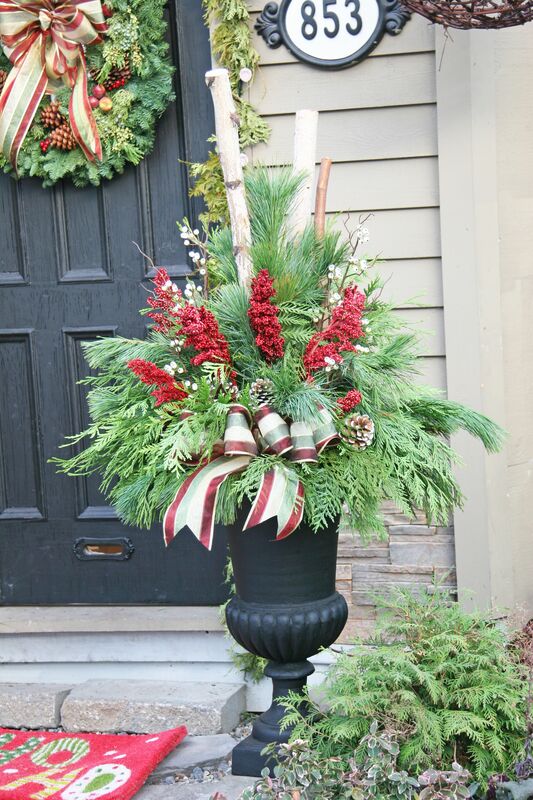 Can I do Christmas greenery in urns like these pics? Use oasis and keep wet? We never know if a Santa Ana wind will show up. Would love to do this. Thanks for answering. They’re just beautiful. Ananda – I live in the cold north/midwest. My planters are a lightweight material. I weigh them down with a few bricks and other material, then fill them with greens and other things. Someone wrote on a video on my YouTube channel that I should fill the planter with soil, water it, and then put in the winter greens. She said that would make the greens last longer. But that water will freeze starting next week when the high temperatures are expected to be 27 degrees. What do you think? What should be inside the winter planters in climates with below freezing temperatures all winter? Soil + water like this person suggested? Or other materials? Thank you, Ananda! That is good to know.